Stay scared while the government steals your rights. What if I told you about a conspiracy that involves a group of people who are working on making a weapon never before known to mankind? This thing will change the face of war forever and so anyone who comes into the knowledge of this process is either: absorbed into the project, assassinated or imprisoned. The sceptics are scoffing at me and all rolling their eyes right now, but what if I told you that this weapon really existed, and that this process was real and that on August 6th 1945 America used this weapon… on Japan, producing its desired results. Wouldn’t that be a conspiracy? The Conservatives and the Liberal Democrats met behind closed doors to thrash out how they would rule Britain after the last general election. There are companies that meet everyday to decide which chemicals are the cheapest to put in their products and how to alter the law to make them sellable. Big industry lobby politicans behind closed doors for tax breaks while the Government cut social services. There are governments who will use men like Bin Laden all the time as a proxy against their opponents. That is also a conspiracy, and since we are one of those governments who used such a man, we are the conspiracy. Not all people who doubt the official version of the story are raving lunatics, though. Some have an honest distrust of their own government. This is the legacy left behind by Osama Bin Laden, why is it that if anyone questions the fast unravelling narrative off the official story are they then branded conspiracy theorists? This is based on an excellent piece titled “The Legacy of Bin Laden” by activist and social commentator Immortal Technique, The Akh recommends you read it. Anjem Choudary and his group Hizb ut Tahrir, Al Muhajiroun, oh right…Muslims Against Crusades decided to hold a symbolic funeral for Osama Bin Laden outside the US embassy on Friday. Now a whiles back, The Akh put to paper the following observation that Anjem Choudry, MI5 & Far Right need each other to further their own interests. “A child of three could see through this scam. Muslims brainwashed by extremist preachers on the MI5 payroll – people like Anjem Choudry and Abu Hamza, are told to riot in London and threaten retailiation attacks for the death of Bin Laden. This not only reinforces the Bin Laden fable, but it also allows the media to whip up anti-Arab sentiment amongst British and American citizens by bombarding them with images of screaming Muslim extremists. Look at these savages – they want to impose Sharia law, they want to build mosques at ground zero! This must mean that the bombing of Libya and Iran is the right thing to do! Let’s just not mention the fact that the US and UK military are now actively supporting Al-Qaeda in Libya and Iran in an effort to overthrow Gaddafi and Ahmadinejad. And ever since, The Akh’s original post has been replicated here, here and here. Even the masses are beginning to see through the lies…they say the truth will out…Haqq overcomes Baatil…Insh’Allah we’re getting there. For years The Akh has harboured suspicions that Anjem Choudry and his mentor OBM (Omar Bakri Muhammed) are agent provocateurs that always discredit and harm the greater body of Muslims by provoking their own members to commit wrong or rash actions. As ever, in the picture above, Anjem Choudry is lying deep behind the front lines, whilst no doubt hyping up the youngsters in front of him. Osama Bin Laden Tried in Court In absentia Trial – Guilty or Not Guilty? The Dutch television show “Devil’s Advocate”, tried Usama Bin Laden in front of a jury, with Dutch Master of Law, Gerard Spong defending. Amongst the prosecutions star witnesses were American correspondent Charles Groenhuijsen and terrorism expert Glenn Schoen. Long before The Akh started up Hotter Than A Pile Of Curry, he would write and submit articles to a whole host of outlets, this particular one was picked up by the Muslim Public Affairs Committee back in April 2009. The inabsentia trial of the most wanted man on this Earth has recently concluded, with a jury finding Usama Bin Laden NOT GUILTY of masterminding, planning, financing and heading the terrorist attacks of September 11th 2001. The jury were instructed to decide if the acts of terror committed on 9/11 can be rightly attributed to Usama Bin Laden. Indictment 1 – Usama Bin Laden gave the order for the attacks of September 11 2001. Indictment 2 – Usama Bin Laden is the leader of Al-Qaeda. Indictment 3 – Usama Bin Laden is a terrorist. On the second indictment, the jury considered it a fact that Al-Qaeda exists, but whether Usama Bin Laden is the undisputed leader of the organisation is something the jury has doubts over. NOT GUILTY. On the third indictment, the jury almost unanimously decided that Usama Bin Laden to be a terrorist. GUILTY. This evidence was never produced. In a court of law, it falls onto the accusing party to prove beyond a reasonable doubt that the accused is guilty. 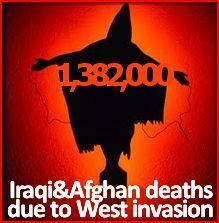 Yet the only result we have seen was not only the war in Afghanistan, but also under a cloud of lies, the war in Iraq. Muslims are often accused of having conspiracy theories, but there wasn’t a single Muslim in the jury that tried Bin Laden on Devil’s Advocate. The truth about what happened on September 11 2001, is not in the public domain. Perhaps one day all will become clear, but I don’t think we will like what we find out. I will be writing one final piece on this subject tomorrow Insh’Allah, looking at the legacy left by Osama Bin Laden.